A strange trend noted by several people in the community is that whenever a pony fangame comes out and is at least partially based off of another game, it almost always ends up being more difficult than the original. Oddly enough, this usually seems to be entirely unintentional on the developer's part, and it is often debatable as to whether or not the increased difficulty is really a good thing. MegaPony is already an infamous example of this, sure, but is the game's quality negatively affected by this? The answer, along with the rest of the review, can be found beneath the break. Your average gamer's first few hours with MegaPony will inevitably be filled with frustration and rage as they get used to the overly sensitive controls, the odd level designs and the titular protagonist's rather large hitbox. Most won't even manage to complete a single stage, but MegaPony is not for the faint of heart and for those that do press on, something magical happens. Levels that stumped them for hours on end will suddenly become a breeze as the player learns to master them, and with enough endurance one can overcome incredible odds. For a while it may seem somewhat repetitive, sure, but the exhilarating sensation one receives upon finally completing that one level and defeating that which earlier brought you to your knees makes it all worthwhile for those who persevere. Contrary to popular belief, unicorns can climb ladders too. 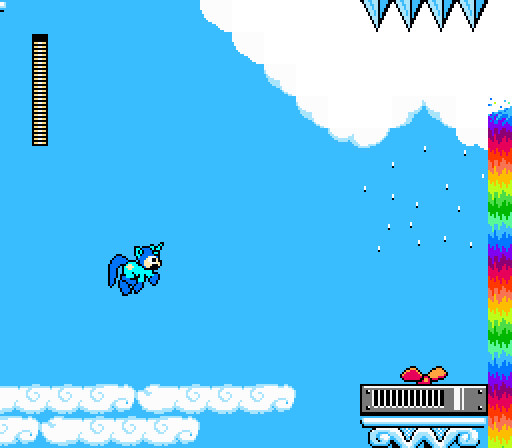 Despite its overall difficulty, MegaPony's gameplay is quite simple. 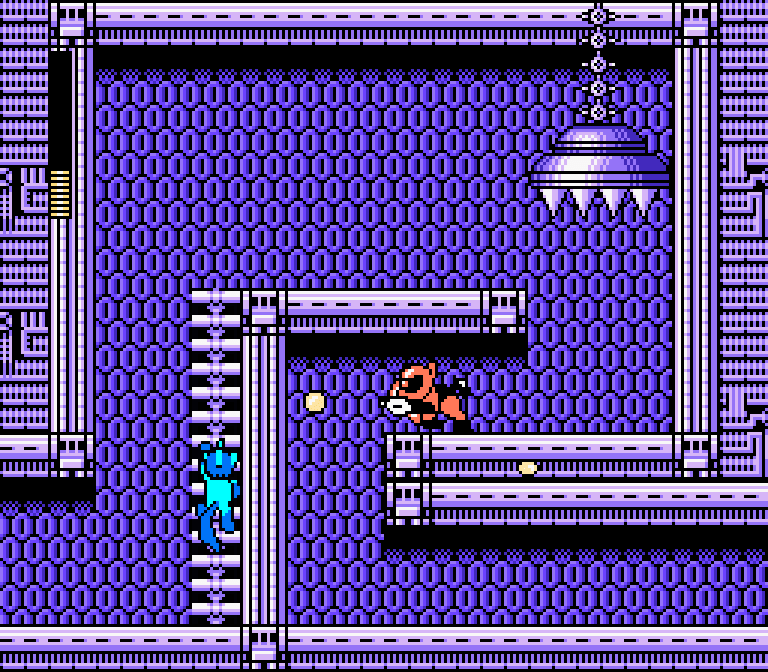 The player runs around as a chubby robot and shoots stuff, all the while dodging bullets and jumping over bottomless pits. Upon completing a stage and beating its boss our hero is awarded a brand new weapon, which also happens to be the weakness for another boss. After defeating the brainwashed Mane Six, he unlocks the final stage along with itsboss, Discord. 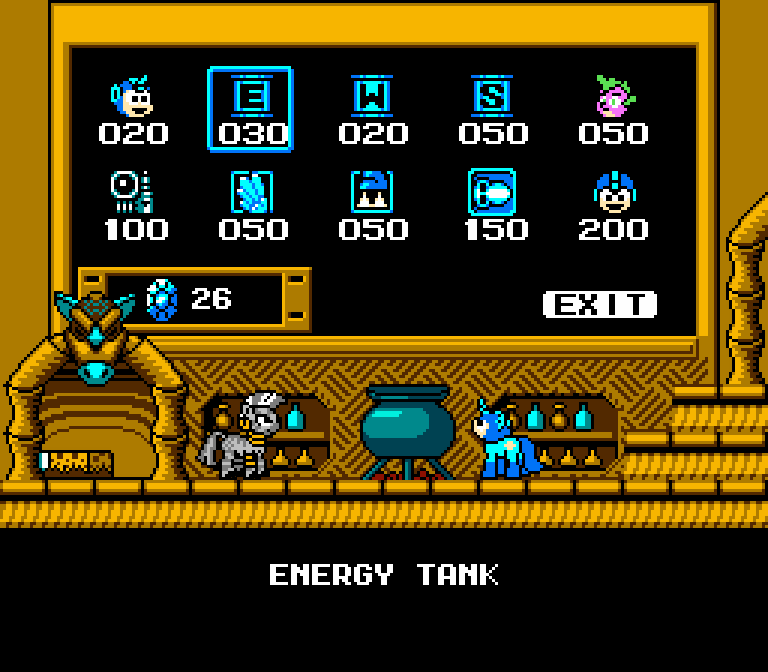 He can also access Zecora's shop to buy items and upgrades to improve his odds of victory, although purists might want to stay clear of the place (aside from a certain upgrade that adjusts the protagonist's hitbox to be closer to that of the blue bomber). Stages tend to have a surprising amount of variety, with little in terms of repetition when it comes to visuals and room layouts. Several of them also introduce new gameplay elements, such as the teleporters in MagicMare's lair and the fishing rod in GenerousMare's stage, the latter of which transforms the game into a weird autoscrolling shooter. Thankfully each level's gimmick is used in moderation, so for the most part they don't end up feeling overused or tiresome. There's a distinct lack of flashback potions here. Aside from several areas (such as Applejack's stage), the game does quite well at staying within the NES' colour limits and still manages to look good in the process. Unfortunately the screen scaling options seem to be a bit off, as using them blurs the game's crisp pixel art, making it harder to fully appreciate the detail put into it. It also forced me to take screencaps with the default screen size and manually upscale them in Gimp, which kind of sucked. The music was pretty nice too: a fitting blend of Megaman themes and My Little Pony chiptune remixes, although to be honest the music gets old after being stuck on a stage for long periods of time. To be honest, I don't really have much to criticize MegaPony for. Sure, the main character vaguely resembles one of Clarence's hippopotamuses and there are still a few bugs/imperfections to be ironed out, but most of the possible changes would lower the game's difficulty and thus arguably reduce the game's main draw (aside from its containing ponies, of course). I wouldn't say this is anywhere near the best pony fangame yet, true, but those of you who are looking for a real challenge should ultimately find MegaPony to be quite rewarding. It remains to see how Megamare X will compare to this, although I doubt it'll even come close to this one's difficulty.